With his distinctive “Big Beard” Captain John Macy has been a fixture on the Christiansted Boardwalk and within the sailing community on St Croix for almost 30 years. He made his way to St Croix via Oregon in January of 1979. He’d gone off to find himself and find himself he did… on St Croix. He began by crewing aboard a sail boat that took passengers out to Buck Island (sound familiar) and has been heading out there ever since. 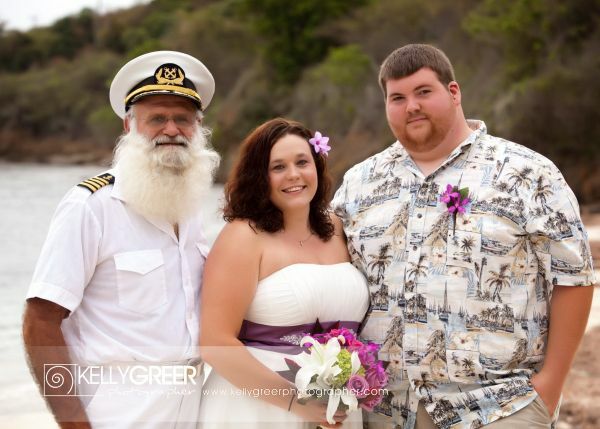 Captain Big Beard has also been an officiant on the St Croix wedding circuit and couples for over 25 years have included him as a part of their personal history. He performed a mock wedding on April Fool’s Day, 1985, with his first certified wedding service in January of 1986. Captain Big Beard performs ceremonies on land or aboard one of his fine vessels. In June of 1983 Big Beard bought a share in one of the Buck Island company’s vessels – an old Nova Scotia built lobster boat called the Sea Spy. In the Spring of 1985 he purchased “Flyer”, a sturdy wooden catamaran that had sailed across the Atlantic from France. He got her certified and had her sailing by July. In 1993, came “Renegade” a 42′ foot sailing catamaran built by Gold Coast Yachts specifically for transporting snorkeling enthusiasts out to Buck Island National Park and the Sea Spy went into retirement. Renegade typically handles the full day trips (a GREAT way to spend a day enjoying Buck Island and St Croix). The full day tour includes your snorkeling adventure to Buck Island and then a casual beach bbq back on a semi-private, white sand beach popular with local kite surfers. In 2009 the youngest sister of the fleet was added – “Adventure” – replacing Flyer on the half-day tours. (Though she still remains in service as a backup boat) The Adventure, also built by Gold Coast Yachts, is a hybrid vessel offering a greener motoring experience and getting you out to Buck Island in less time. She holds 49-passengers and the hybrid nature is pretty cool. Her diesel engines power her out to Buck Island and while they are running, they also power a couple of electric motors. Once inside the park limits, the captain switches over to the electric engines. This allows Adventure to motor through the pristine reef silently and without pollution. If you would like to experience Buck Island for yourself, we recommend spending the afternoon or the day with Big Beard’s Adventure Tours … tell them “My St Croix” sent you or contact us and we’ll take care of all the details for you! 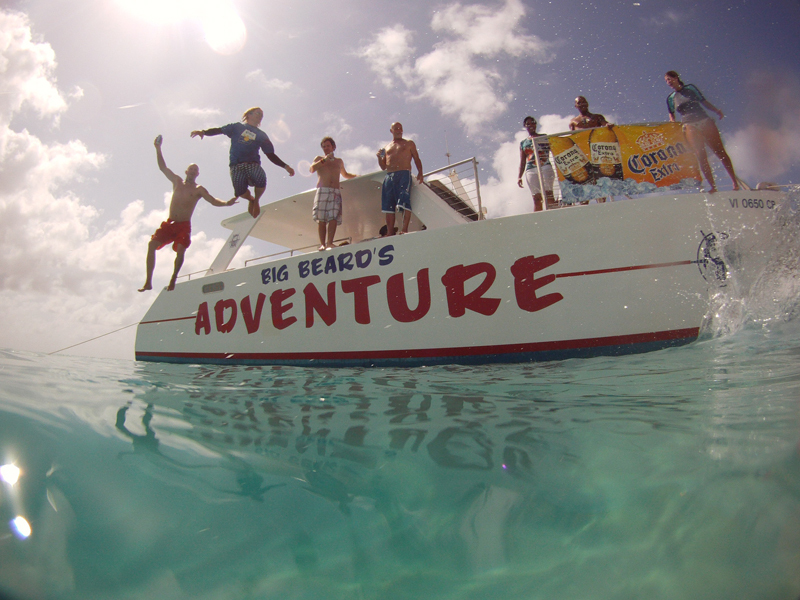 Bringing a group or want to plan out your St Croix Adventure before you get here? Contact us at adventure@my-stcroix.com for group rates, accommodations and a customized itinerary. Your one-stop-shop to the best St Croix has to offer!